From opulent brocades at Stella McCartney to street chic looks at Balenciaga, the Fall 2012 fashion runways were filled with cobalt blue clothing. Perfect for work or play, the color flatters almost every skin tone and exudes power. The sleek cobalt blue pants from Prabal Gurung have rock royalty written all over them and the colored *fur at Lanvin is a work of art (*shhhh, don't tell PETA). This summer, pair cobalt with crisp white and pops of neon. I'm usually not one for lace, but this Robert Rodriguez blouse has a bit of edge in the bright hue (the dress version is also fab). 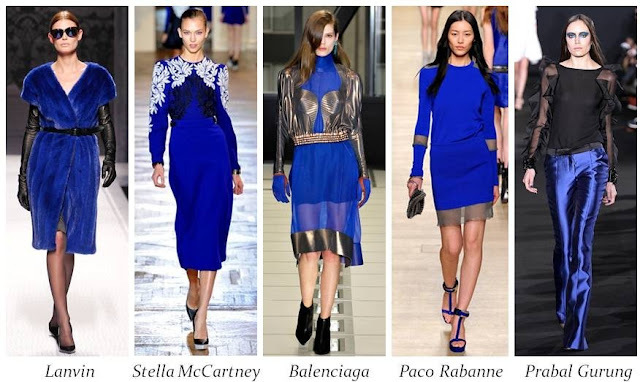 For fall, I plan on teaming cobalt clothes with other jewel tones, black, and gold accents to create a luxe look. Modern tuxedo inspired pieces turn heads when updated in this current color. This is a really bold color, I love the selection you made here. I love this color with the tuxedo stripe down the side! That seems like it would be extremely flattering. I love cobalt, its a great color to add some pop to an outfit. The 3rd dress on top is perfect! awesome selection. So cute! I just did a post wearing a blue cobalt blazer! I think it's my new favorite color! Loveee your selection of cobalt pieces- such a nice colour for summer! I love how you've paired it with that zingy neon- would be lovely to add a nice neon Zara necklace as well! Just trying to get a few more people reading my blog so would be so nice if you could have a read and maybe follow me on GFC? Lots of love! Great post I love this kind of blue I have a ruffled blue dress and looks wonderful. Love the blue harem pants, this is a great color! I love this colour, it looks so fresh against white! I adore cobalt and glad to hear it'll be around for the fall! This color is absolutely fantastic!! I LOVE this color - I think it looks incredible on absolutely everyone. Love that tuxedo blazer - suuuper cute! Wow, cobalt is such a beautiful color, and your picks are simply stunning! I'm especially in love with that pretty lace top, it looks fantastic! This is my color. It's a really tricky one to wear, though. I adore cobalt, you picked out such great items here! Love those cobalt blue baggyish pants in the last set of photos. That is a very nice color and Lanvin is always so classy. I adore this color !! Love the lace top with the white skinnies ! Cobalt blue is one of my favorites! I love that striped Equipment blouse!! does it sound like a lie when i say i want it all?! because I do! OBSESSED with those two-tone heels in your first image. GORGEOUS. Love your finds. Loving the color inspo! Loving the striped blouse and trousers! I adore the 'Later' Styling - very cool! I love cobalt blue! It's so vibrant I feel it brings life to any outfit. I actually just bought a dress from Anthro in the color and I'm obsessed, haha! I posted about cobalt this week as well! need that lace top! It's like you read my mind. I'm OBSESSED with cobalt these days! SO glad to have found your amaze blog! Cobalt is so nice on almost every complexion....I love it!!! I love the bold color of blue! It works so well, and looks extremely stylish! Cobalt blue is my all time favourite colour! Love this post. I am always on the lookout for the best cobalt fashion and your post has definitely helped/inspired me.